Dogged by suggestions he's too old to be president, John McCain often says he should bring his mother to campaign stops to demonstrate his good genes. On Wednesday he did. "I am so happy to be here. I think I'm going to cry," 95-year-old Roberta McCain said as she introduced her son to about 200 seniors at a retirement community. 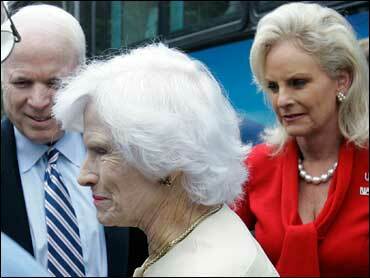 She said three generations of McCain women are supporting his campaign. The 71-year-old Arizona senator told the crowd Medicare was set to go broke in 2019. "I would also remind you that Social Security is going to go broke as well," he said, pointing to a chart. He said older voters owe it to their children and grandchildren to fix the problems. McCain is trying to raise his profile on a two-day swing through the state. Despite his loss of momentum in the summer amid a financial meltdown, people are no longer quick to write him off - especially here, where he remains popular among older Republicans and those with military ties. Faye Trueblood, the community's self-proclaimed oldest resident at 103, said she hopes no more candidates join the crowded GOP field. "They just keep joining - like Thompson," she said of Fred Thompson, the actor and former Tennessee senator. "Thompson's interfering with my feelings about this guy," she said of McCain. The senator said Trueblood's age made his mother "look like a spring chicken." While Trueblood hasn't decided on a candidate, she has decided against former Massachusetts Gov. Mitt Romney. "I'll tell you one thing, I don't like Romney," Trueblood said. She's a Southern Baptist and says she doesn't care for Romney's Mormon faith. Romney's religion was no stumbling block for Bob Jones University chairman Bob Jones III, who said this week he was backing the former governor. Jones ran the Christian fundamentalist school in South Carolina in 2000 when McCain criticized its ban on interracial dating and its anti-Roman Catholic views. McCain also criticized his then-chief challenger, George W. Bush, for speaking there. "Actually, I haven't been critical of Bob Jones University in the past, except I did not agree with their racial segregation policies - which they have done away with," McCain said. On Wednesday, the college sent out a news release saying Jones' endorsement of Romney did not reflect the school's position. McCain said he was building his own evangelical support in South Carolina, noting that state Sen. Mike Fair, known for his conservative views, was working on his campaign.